Cha Le Teahouse provides a modernist interpretation of the traditional Chinese tea ritual. The space is defined by a minimalist character that relies on an interplay of geometry and material uniformity. 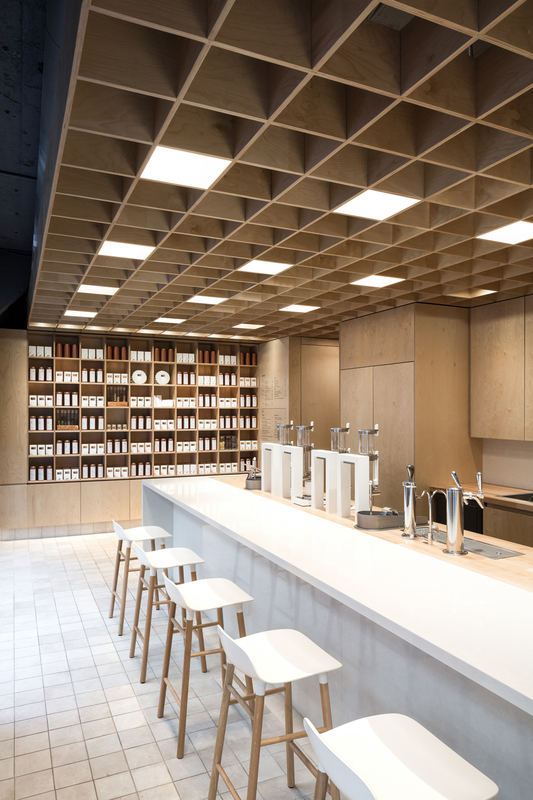 A meticulously coordinated plywood matrix operates as an ordering system for the casework and retail display – this motif is replicated throughout the space to create a sense of rhythm, depth, and shadow. This uniform material backdrop lends visual calm and abstract serenity to the immersive sensual experience of drinking tea. The focus on wood is economical, and alludes to the sensitivity to materiality that is significant to traditional Chinese tea ceremonies, and often expressed through humble materials. The sculptural mass and quality of the ‘tea bar’ creates and shapes the space around it, finding inspiration in the Modernist sculptures of Donald Judd. Materiality is central to the tea ceremony – beyond the sensual qualities of the tea, the ‘interplay’ between natural elements in the space and objects of the ceremony equally inform the experience. The ceremony of exchange and the concentration of awareness towards posture and gesture is articulated through simple objects. The senses are heightened by focusing on a single material, revealing the variations and unique qualities that are inherent to items of ritual. The design for Cha Le Teahouse interprets this attentiveness by elevating modest, ubiquitous construction materials to allow for architectural clarity and refinement.